First Baptist Church of Opelika has established First Baptist Opelika Christian School under the authority and guidance of the church leadership. First Baptist Opelika Christian School desires in everything it does to lift up Jesus and to love people while pointing to God and His wisdom as parents choose how and where to educate their children. The purpose of this ministry is to provide those parents who choose to homeschool their children legal covering, support, and encouragement in the spiritual development and sound academic education of their children with respect to established state guidelines. The education of each individual child shall be the responsibility of the participating member parents, who are answerable to God as their ultimate authority. With input from the Advisory Board, appoint a First Baptist Church of Opelika member to the positions of church school administrator, principal, and/or superintendent when those positions become vacant. When necessary, meet with the church school administrator, principal, superintendent, and/or Advisory Board about any legal or moral issues concerning FBOCS. Evaluate and make recommendations to maintain the integrity of the instructional process and the intent of the Christian ministry. With the church school administrator, process the applications of families that desire to be included in the church school ministry as deemed necessary. Validate the church school enrollment forms and maintain files as deemed necessary. Interview and process the applications of families that desire to be included in the First Baptist Opelika Church School Ministry, as directed by the superintendent. Notify appropriate school board of the student’s enrollment or withdrawal in First Baptist Opelika Christian School as required by Alabama Code §16-28-7. Cooperate with the superintendent to maintain files as required by Alabama Code for church schools, including such records and files that the superintendent deems necessary and appropriate. With each enrolled family, review the progressive curriculum, lessons, activities, and progress of each student. Appoint members into leadership positions as necessary to meet ministry needs with approval of the superintendent. Financial compensation of the church school administrator and principal will be reviewed and approved annually by the superintendent and Advisory Board. The Advisory Board will be composed of at least three but no more than seven members. This will include the church school administrator, principal, and superintendent as well as experienced Christian homeschool parents who have displayed leadership skills, both in the home and in school activities. The current Advisory Board will appoint members of the Advisory Board. Advisory Board members will serve a two-year term that may be renewed. The Advisory Board will meet as needed to set school policies regarding staffing, family admissions, finances, graduation requirements, and disciplinary measures. Applications for enrollment in First Baptist Opelika Christian School are available from April 1 through June 30 and must be submitted to the church school administrator by June 30. An enrollment interview is scheduled by the administrator at his/her discretion. The purpose of this interview is to review the family’s plan to establish a home education program. Families must pay an annual tuition fee of $150. Families with high school students pay an additional fee of $50 for one high school student or $75 for two or more high school students. Checks must be payable to First Baptist Church Opelika. A $25 service charge will be assessed on all returned checks. A $25 late fee will apply to anyone paying tuition after June 30. A $35 registration fee, payable to First Baptist Church Opelika, is due the first time a family registers. If a family leaves First Baptist Opelika Christian School and returns, the registration fee will be due again. A signed church school enrollment form for each student of compulsory attendance age (from 6-17 years of age before September 1 of the school year) must be submitted to the administrator by June 30. Families must enroll in Home School Legal Defense Association (www.hslda.org or 540-338-5600) at their own expense by July 15 or renew their current membership within 30 days of their expiration date. Discount information is available from the administrator. Enrollment in First Baptist Opelika Christian School is not considered final or official until HSLDA membership has been acquired. Families must submit annual course of study forms for each student by July 15. Application forms and fees received after June 30 will incur an additional late fee of $25. Failure to pay charges or tuition in a timely manner will result in termination of membership. Families who have no home-educated children of mandatory attendance age (from 6-17 years of age before September 1 of the school year) may join as associate members to attend church school activities, receive encouragement, use the resource room, and receive mailings. NO ACADEMIC RECORD KEEPING WLL BE DONE FOR THESE FAMILIES. Associate member families must submit annual application forms by June 30. Associate member families must pay an annual tuition fee of $50. Checks must be payable to First Baptist Church Opelika. A $25 service charge will be assessed on all returned checks. A $25 late fee will apply to anyone paying tuition after June 30. Associate member families are required to attend all mandatory meetings. No tuition refunds will be given for withdrawals after July 1. Tuition refunds must be requested in writing by the member and submitted to the treasurer by July 1. All requested and approved refund checks will be issued to the member by July 15. Enrollment is open to all families that reside in the state of Alabama within a sixty-mile radius of First Baptist Church Opelika and wish to provide a quality education at home, regardless of race, creed or nationality. Single parents and families in which both parents work may be accepted if they show adequate provision for supervision and education of the student. Both parents must agree in their desire to home-educate their child(ren). Grandparents who are home-educating their own grandchild(ren) will be considered for enrollment only if they can demonstrate proof of their legal guardianship of the student(s). Church school membership will be open to members and non-members of First Baptist Church Opelika who agree to follow the policies stated in this handbook and to place themselves under the authority of the First Baptist Church Opelika leadership as it pertains to First Baptist Opelika Christian School membership. First Baptist Opelika Christian School reserves the right to accept or decline any application for membership at the discretion of the Advisory Board. Adhere to all enrollment procedures. Submit all forms by the stated deadline. If the forms are not received within 10 days of the due date, the parent will be notified and will be given 30 days to comply before dismissal from the church school. Have internet access and provide FBOCS with an actively monitored email address. Annually enroll in Home School Legal Defense Association. HSLDA membership is required by July 15 or within 30 days of current expiration date. Members who do not enroll by July 15 or allow their current membership to expire will be given 30 days to comply before dismissal from the church school. Attend the mandatory annual orientation meeting for both parents and the mandatory mid-year progress meeting for the teaching parent only. Additional interviews may be requested at the discretion of the church school administrator. Notify the church school administrator at least one week prior to any mandatory meeting if parents are unable to attend. If parents are unable to attend a mandatory meeting, they will be charged a $50 fee ($25 payable to the administrator and $25 payable to the principal) and must attend the scheduled makeup meeting. Members who do not comply with this policy will be dismissed. Select and purchase a progressive and organized course of study. Parents may use any teaching resources that suit their student’s needs. Courses should include mathematics, reading, language arts, social studies, science, and physical education. 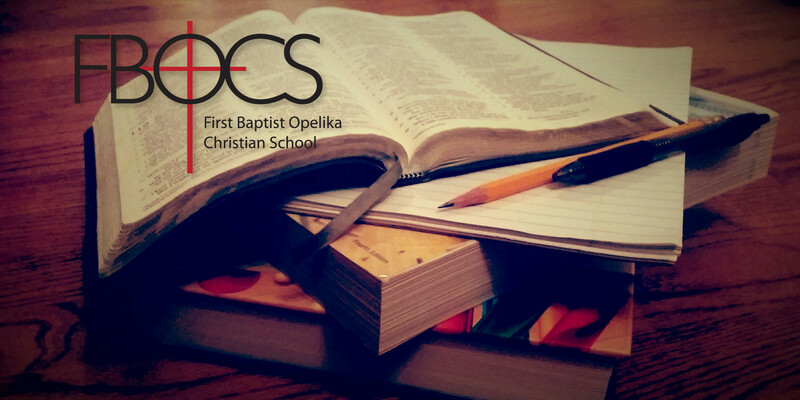 In addition to these subjects, students enrolled in First Baptist Opelika Christian School must receive Biblical instruction. Develop and maintain a daily program journal/plan book that includes lesson plans and days of attendance, according to established Alabama Code requirements. Families will be required to present these records for review at the Mid-Year Progress meeting and during the school year at the administrator’s request. Submit standardized test scores for students in grades 4 and 8 to the church school administrator. Tests must be administered by a non-family member and scored by an approved independent testing service. Scores must be accompanied by a signed FBOCS Standardized Test Administrator Form (a signed statement by the non-family administrator attesting that the test was administered according to official testing instructions). File all end-of-year reports on or before June 10. End-of-year reports include: final bimonthly report, annual attendance record, and year-end report card. For high school students only, high school documentation of course work including grades and credit hours achieved is required in place of a report card. Notify the church school of any change in contact information, including a change of name, address, or phone number. The change must be submitted to the church school administrator within five days of the change. Complete 160 days of instruction during the academic year. First Baptist Opelika Christian School’s academic year begins July 1 and ends June 30. Time spent on educational field trips or other educational activities can be accumulated to count as days of attendance if desired. This does not include Vacation Bible School, camps, or other events that are non-academic. Observe good behavior, respectful attitudes, and modest dress at all school functions. Accept leadership and support positions in planning, conducting, and attending church school ministry activities as led by the Lord. First Baptist Opelika Christian School strives to glorify God in the way we present ourselves. Overall standards are the responsibility of the parent. However, since our students represent First Baptist Church Opelika and homeschooling in general, this dress code has been established for school activities. If there is a concern about a student not meeting the dress code, a First Baptist Opelika Christian School leadership representative will counsel privately with the parent and/or the student. No spaghetti straps, muscle shirts, mesh shirts or any see-through shirts or blouses. Shorts and skorts must fall below bottom of fingertips. Skirts & dresses must come to the knee. (Only slits below the knee are acceptable). No jeans with holes above the knee. No exposed skin between clothing top & clothing bottom. No exposed underclothing (not even through a hole). No clothing with profane or obscene words & slogans or beer & cigarette symbols. No hats or caps inside buildings. Post-secondary enrollment (also known as dual or joint enrollment) concurrent with high school studies is acceptable. The student is responsible to obtain the necessary form(s) from the institution and obtain the appropriate signatures. The student is also responsible to make sure the institution mails an official transcript to First Baptist Opelika Christian School in order for the grades to apply to the high school transcript. ACT and SAT college entrance exam information will be available each year upon the student’s request. In order for the scores to be applied to the official high school transcript, students must use the First Baptist Opelika Christian School registration code (012-056) at time of registration. Scores earned prior to enrollment in FBOCS can be applied to the transcript with the submission of a copy of the official score report. First Baptist Opelika Christian School is a church school established by the ministry of First Baptist Church of Opelika in accordance with Alabama Code 16-28-1(2) in which home educators enroll their children but teach them at home. The staff of First Baptist Opelika Christian School has established academic policies at or above the level required by the Alabama Department of Education that each student is required to fulfill in order to receive an official transcript and diploma. Families must annually enroll in the Home School Legal Defense Association (HSLDA) at their expense. For their own protection, parents should immediately phone HSLDA concerning any contact from any governmental authorities, legal proceedings involving home education, or other circumstances that may pose legal risk for the family, including lawsuits and custody hearings. Parents must also then notify the administrator and/or principal right away. Failure to do so could result in dismissal and additional legal problems for the family. Students of First Baptist Opelika Christian School are considered “church school students” not “homeschool students,” in dealing with legal authorities. Distinct and separate laws govern “church school students” and “homeschool students”. Parents should not discuss specifics of their schooling with authorities but should refer them to the administrator and/or principal. First Baptist Opelika Christian School is not responsible for problems caused by failure to follow this rule. Parents of students enrolled in First Baptist Opelika Christian School are considered unpaid teachers who engage in the education of their own children. Parents may employ other teachers of their choice at their own expense; however, the responsibility of the proper education of the student(s) ultimately lies with the parents. First Baptist Church Opelika, as sponsor of this school, reserves the right to veto any activity or behavior that violates its religious beliefs. First Baptist Church Opelika, in providing a facility for use, will not be responsible for any injury that occurs on church property, on field trips, or at church school activities. First Baptist Opelika Christian School, First Baptist Church Opelika, and its pastors, employees, agents, and volunteer workers assume no liability for any injury, loss, or damage to person or property that may occur during the course of a family’s involvement in any activity sponsored by the church school. First Baptist Opelika Christian School and First Baptist Church Opelika assume no responsibility beyond the statements of this document.